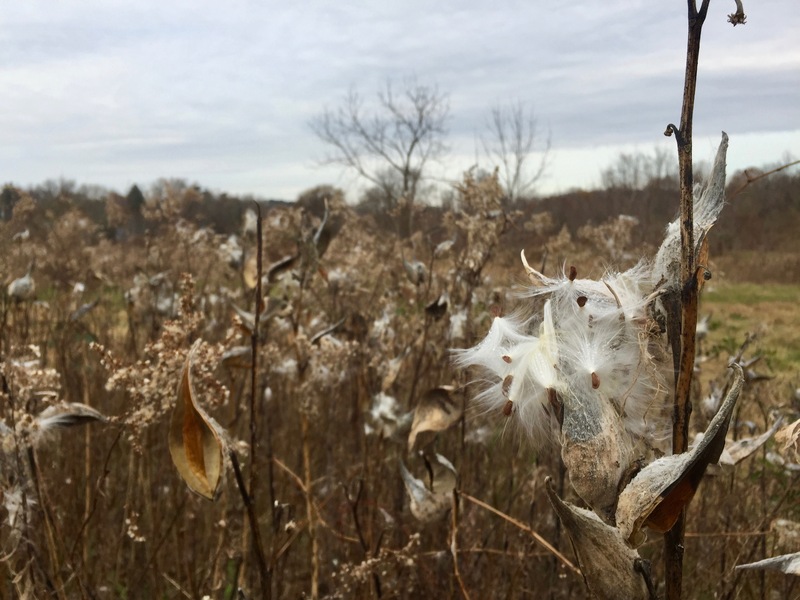 Otto Farm Preserve – A crisp morning walk after the first hard frost. Otto Farm Preserve is located on Wertsville Road in Hillsborough. Truth be told, I have been putting off coming to Otto Farm Preserve for quite a while now. I was told that it was “boring…” so I kept delaying my visit. When I finally checked my Sourland Conservancy Hiking Atlas, I realized that I have explored 21 out of the 25 Sourland preserves (There are 24 preserves in the atlas but Zion Crossing was added since the atlas was published). Since I was really itching to see a new preserve and my time was limited, I decided that it was now an opportune moment to check out Otto Farm. When I pulled into the parking lot, I was immediately charmed by the layout of the preserve. As much as I love hiking through the woods, there is something wonderful about open meadows. This time I was hiking solo and the wide mowed paths and open sky at Otto Farm offered me the opportunity to daydream, which is a luxury that as a Mom of Little Dudes, I usually don’t have time to enjoy anymore. Otto Farm is different than the Sourland Preserves I have previously explored. It has its own unique charm and beauty. There were many flowers in seed and I took over 200 photos as I wandered because at every next step there always seemed to be an even better photo opportunity to be taken. If you are able to get out there please do! It would be a mistake if you missed out on these beautiful fall seeds and daydreams in all their glory. Milkweed, Ascelpias syriaca, in seed. I love these seeds and I can’t even count how many times I have seen them disperse through a beam of light cast by the beautiful late afternoon sun. I often contemplate photographing the seeds as they begin their flight. Unfortunately, in the late afternoon I am often rushing to pick up my Dudes from school or hurrying home to make dinner. Not today! Although I was hiking in the mid-morning, there were still plenty of milkweed plants to be photographed! Watching milkweed seeds float across the sky is a daydream in itself. I have the sense of drifting alongside them in the soft Autumn sunlight and, as we travel, time stands still. Goldenrod, Solidago canadensis, in seed. Although this plant is in seed, in my mind’s eye, all I can see are beautiful golden flowers. An empty snail shell nestled under the leaves. I get giddy when I see stream crossings! I can’t help getting older, but I don’t have to grow old! I could barely contain myself as I leapt from stone to stone. I don’t know what I will do with myself if I ever get tired of stream crossings! Can you spot the Red-tailed Hawk, Buteo jamaicensis? The slow death of a giant. This beautiful oak tree is dying. You can see the branches snapping off and the bark pealing off the branches that are still attached. Another sign of death are all these mushrooms on the branches. Often times a tree covered in mushrooms is dying (or is already dead). Mushrooms (fungi) are the great decayers of this planet and when you see them growing up and down a tree you can be certain that a tree’s end is near. Oriental bittersweet, Celasturs orbiculatus, berries. This invasive vine has spectacular fall berries which makes it hard to hate them. I will definitely come back to this spot in the summer for a picnic under the shade of this oak tree. A goldenrod gall. The larva living inside a goldenrod gall can survive inside even when the air temperatures outside are below freezing. Crack! I heard the cracking of the ice before I saw the frozen ground. I love the sounds of Fall and Winter hikes. The crunch of leaves, the snap of ice and the “shhhh” of snow. The fade out of Fall. If you had examined this spot in September, you would have seen the deep yellow of the Goldenrod, Solidago canadensis, the pale yellow of Mullein, Verbascum thapsus, and of course the beautiful pink of Milkweed, Ascelpias syriaca. I am certain that there are some flowers blending into this area of the meadow, that are camouflaged in the Autumn tapestry. This damage is called a “Buck Rub”. It is created by a male deer as he rubs his antlers and forehead in order to remove his shedding velvet from his antlers and also to deposit pheromones. There are three rubs in close proximity, so we can be sure that this area is frequented by deer. OK, just one more picture of Milkweed…. Sigh… Look at those beautiful seeds that will hopefully find their place in this world. This entry was posted in Uncategorized on November 17, 2018 by Carolyn.